Bell nodded. She'd been fielding that inquiry or a version therof her entire life. It used to rile her when she was a kid--Yeah, granted, it's not Jane or Sue or Mary, but maybe you could just shut up about it--because, really, why should she give a damn what anybody else thought about her name? She'd let go of that anger a long time ago. After all, it was unusual. People often mistook it for 'Belva.' Or, if a new teacher back in Acker's Gap High School had been calling the roll and thought it was a typo, she'd ask Bell how to spell it. Bell would stop herself just in time. Good way to get expelled. I mentioned recently that I tend to 'hoard' some books by favorite authors and save them for a 'perfect' time for me. Julia Keller's series featuring Bell Elkins is one of those I might 'hoard' - which I did with this 7th entry. Ah yes. My good blogging friend Susan said it best here - it hit her in 'all the feels'. And I say - me too, me too. By the way, Susan is the one that convinced me through her wonderful reviews to try this series. I am deeply indebted. If you're interested in it, the first book is A Killing in the Hills, and you might not want to read any more of this post - spoilers, you know. Bell Elkins' life is a lot different in this book than in the previous books of the series. She no longer has her job in Acker's Gap, West Virginia. She recently was released from prison. She's finishing up her community service requirement. And deciding what will come next in her life. Her friend, Rhonda, now is the prosecutor. And Jake Oakes, who used to be a deputy sheriff, is now a paraplegic. Acker's Gap though still remains in the grip of drugs and addiction. When the current sheriff asks Jake and Bell for help, they agree and perhaps a new season begins for all of them. I loved seeing all the characters in Bone on Bone. Many from previous books are revisited or updated. Yes, there will be changes, but my guess is the author has left things open for new vistas and possibilities. The crime solving itself in this one wasn't particularly difficult, but it was poignant. Do I recommend this series? Yes, I do, absolutely. Try it, you might like it. 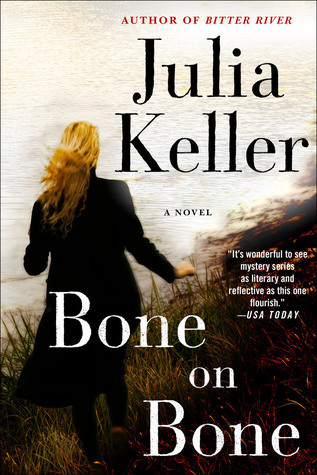 Bone on Bone, the next powerful chapter in Pulitzer Prize-winner Julia Keller's beloved Bell Elkins series, sends readers headlong into the thick of a mystery as young as today's headlines -- but as old as the mountains that hold these lives in a tight grip. How far would you go for someone you love? Would you die? Would you kill? After a three-year prison sentence, Bell Elkins is back in Acker's Gap. And she finds herself in the white-hot center of a complicated and deadly case -- even as she comes to terms with one last, devastating secret of her own. Bell has lost her job as prosecutor -- but not her affection for her ragtag, hard-luck hometown. Teamed up with former Deputy Jake Oakes, who battles his own demons as he adjusts to life as a paraplegic, and aided by the new prosecutor, Rhonda Lovejoy, Bell tackles a case as poignant as it is perilous, as heartbreaking as it is challenging. I totally understand your feeling about "hoarding" books by our favourite authors and save them for a perfect time to read. I'm like that too, hehe. This sounds like an interesting series. Melody, it is an excellent series. I hope that more people will try it. I knew I'd read something by Keller and had to check. In 2014, I read Bitter River and noted in my review that I would be reading more in the series. What happened? Thanks for the reminder, Kay. I'm off to see what I can find in the earlier books before thinking about this one. I'm glad, Jenclair. I think it would be a setting and series you'd like. I read this last year (I'm reading the series out of order and have read all but 2 of the main installments- I don't usually read novella-length issues in a series). I have so much love for this author and her way with words. Her books can be intense but also soothing. I consider these books as some of my go-to comfort reads. I know that sounds strange considering the main arc of the books, but that's how I feel when I revisit this small town in W. VA.
Rita, I don't think it sounds strange at all. Yes, the area and town and characters gets into your heart. I really have loved it, Lark. Yes, I think I've shoved several of the books into the hands of the group. Ha! I don't know if I need one more series, but then, if its good -- maybe I could just try it. It does sound good.